Established: 10 April 1926 by the French High Commissioner in Syria. Awarded under the French "protectorship" for services to Syria and for acts of courage and devotion at the risk of one''s life. Receipt of lower classes was necessary before promotion could take place, except for acts of particular bravery. The medal could be awarded posthumously. This decoration was later redesigned, revised, and extended as the Order of Civil Merit. A decree of 1 August 1927 altered the design of the medal as detailed below. In 1953, the order was superceded by the Order of Civil Merit. Obverse: A six-pointed star (the "Star of Syria"), made of superimposing one triangle over another. The overall impression of a "Star of David." Reverse: First design (1926-27): The inscription in relief "ETAT DE SYRIE", beneath this, in a sunken area, the engraved legend "HONNEUR ET DEVOUEMENT" and the name of the awardee. Second design (1927--): The inscriptions are now both engraved and in Arabic, in the center or "Syrian Merit" and the circular inscription or "Honor and Devotion". Ribbon: Equal stripes of white, green, white. Established: By Legislative Decree No. 153 of 25 June 1953. 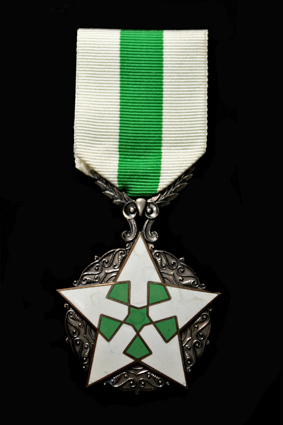 Awarded for service to the state and to wider Arab causes. In normal classes, a recipient begins in the lowest class and, over time, works their way un through the order by successive promotion, often after specified period of service in lower ranks of the award. The order may be presented posthumously. 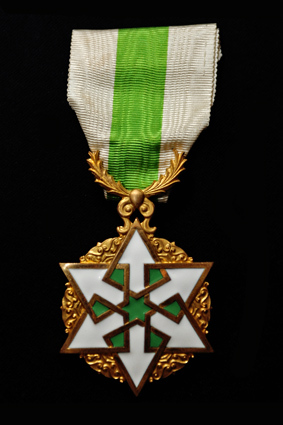 This order represents a revision and modification of the earlier, French-created Honor Medal of Syrian Merit. On occasion, this order has been referred to as the "Syrian Merit Medal". This award is also known, quite unofficially, as the "Order of the Arrows". The redesign of the earlier medal served to remove the overall design similarity of the previous award to a "Star of David" by reducing the number of points of the star from six to five and resulted in a complete redesign of the reverse. Obverse: A gilt circular, patterned plaque, with a gilt five-pointed, white-enameled star. The center enameled green in an open pentagonal shape. The overall impression is of five white arrowheads pointed outwards from a green center. Suspended by a ring. Reverse: Gilt with brown-enameled elaborate Arabic inscription �Order of Civil Merit. Syria". Ribbon: White with a green center stripe.